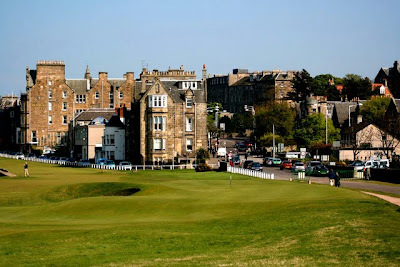 An Opinion On Sports: St. Andrews Lengthens the "Road Hole"
Technology had taken some of the danger out of St. Andrews infamous par 4 17th. With golfers able to drive the ball so much further now, short irons to the green were taking the greenside bunker and the gravel road virtually out of play. For the first time ever, the tee box has been moved back 40 yards, which will make players use longer irons with their second shots into the green. The hole will now play 490 yards, but the line of shot off the tee remains unchanged. Having long been known as one of the toughest holes in golf, the "Road Hole" now has its old mystique back. Especially during Sunday's round of the British Open when the Claret Jug is at stake.